This year, multiple versions of the Great Colleges logo are available to either promote participation in the survey on your campus, or celebrate your college’s designation as a recognized or Honor Roll institution. The logos can be used on your website, in your promotional materials and merchandise, and even in your job ads. To learn more about branding options available in the September 20, 2019 special insert of The Chronicle, in which we are announcing the recognized institutions, contact Suzi Schmittlein at sschmittlein@modernthink.com or 888-684-4658. Use the Great Colleges program logo in your pre-survey communications, promoting participation in the survey to help boost your response rates! Download the Program Logo License Agreement. Review the Great Colleges Logo Guidelines. Email the signed agreement to kkukulka@modernthink.com, or fax it to 888-684-4659. We will return the countersigned agreement along with the same version of the logo ModernThink uses to promote the program. The logo will be provided in three formats: .eps, .jpeg, and .png. Brand your institution as a Great College to Work For to bolster retention of your employees, improve recruitment efforts, and unify your community around a designation worth celebrating! Download the Recognition Logos License Agreement. Please note that, while these logos can be released to participating institutions in advance, use of the Recognition Logos is embargoed until the official release date, September 20, 2019. You will find more detailed language about this caveat in the agreement. If you have any questions about the licensing, feel free to contact Karen Kukulka at kkukulka@modernthink.com or 888-684-4658. 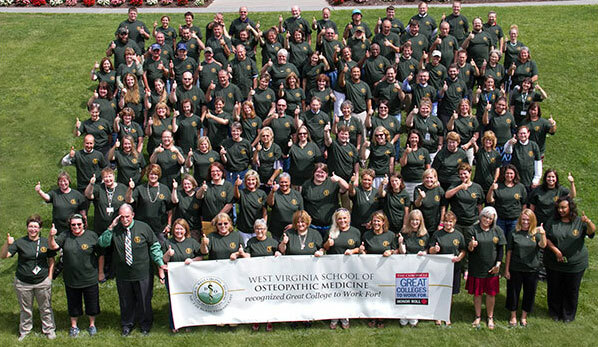 “West Virginia School of Osteopathic Medicine celebrated their Great Colleges recognition with a “Thumbs Up!” campaign.